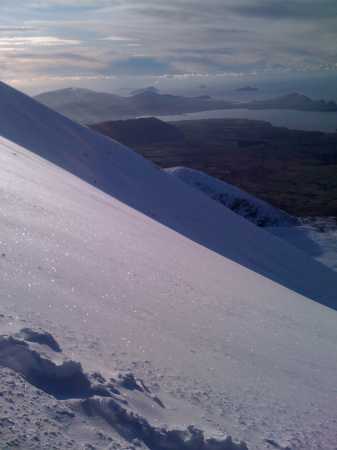 Picture from sbender : Looking out across the slopes of Brandon to the Blaskets in the distance. Picture: Looking out across the slopes of Brandon to the Blaskets in the distance. Climbed Brandon as a newyears day climb. After shaking off the previous night's festivities, the frosty morning cleared our heads. Couldn't get to the grotto's car park due to the icy condition of the small road, so we walked it. A comment was passed about the need of crampons on this small bohereen. We were rewarded with a fantastic sight; virgin snow all over Faha, and got excited. We walked into the coom, the lakes were invisible under a thick pack of snow. The ascent route took us up along the virtualy vertical east-face of the mountain, topping out just at the end of Faha. Crampons and ice-axe were an absolute must, without them this route would not have been possible. occasionally we dropped through the snow's hard frozen crust to disapear waist deep in to it.